The wind strikes the hillsides mercilessly and all the boats at the tiny port resemble carved pebbles. 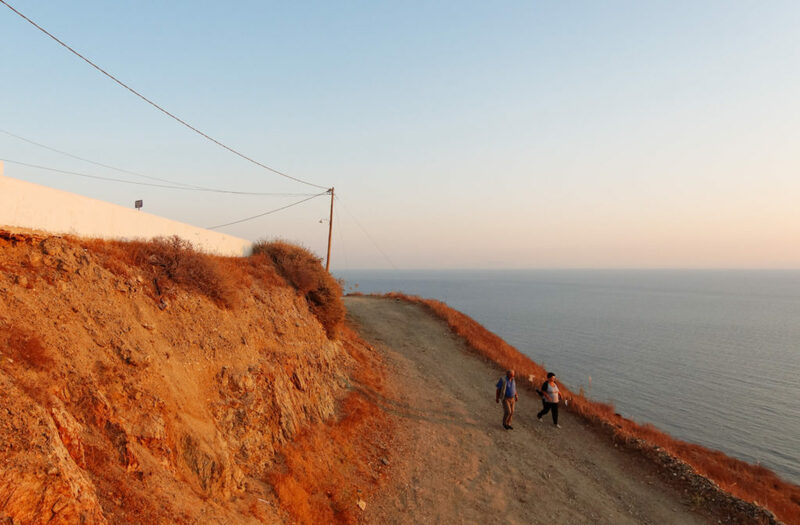 Late in the afternoon, a steep road pushes the travelers towards Chora, and as the sun sets behind the village, one can only see an outline: electricity pillars, TV antennas and a cluster of houses in front of the orange sky. It is a settlement stretching oblongly on the top of the island, resembling dice bestrewed after the only game played under that sky once upon a time. Hills swallowing one another wrapped with dry stacks – and down below, the sea. 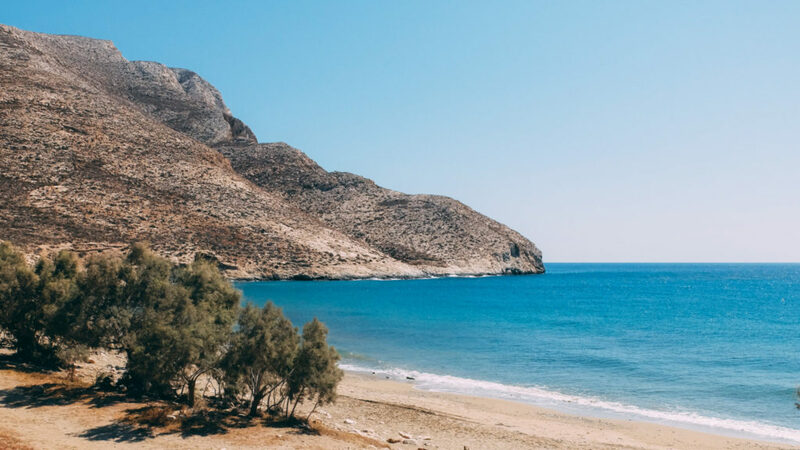 A stripe of barren land amidst the sea: this is Anafi. A dozen Saints supervise the island from their churches, scattered guardhouses made by whitewash with a lonely window to the Aegean Sea. 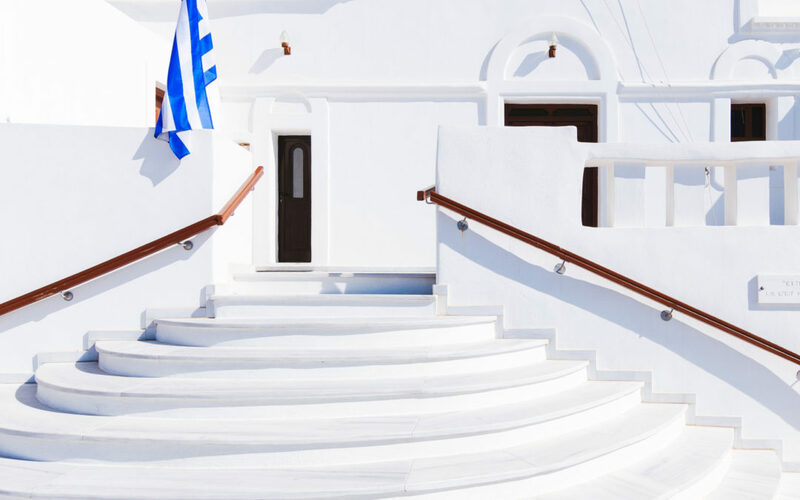 In the taverns of Chora, which in fact are just homes with welcoming courtyards, the talk of the locals always leads to some Saint who helped them in times of need. A woman is narrating how she survived while swimming: behind the high waves she saw the church of Agioi Anargiroi. If she could escape death that day, she promised to celebrate a liturgy. Tonight, she is narrating that story again, with her hands crossed tight upon her chest. All those locals staring at the horizon narrate past stories about the waves and simultaneously observe the travelers. The elderly women, dressed in black, banish their mourning by looking at the linen clothes of the vacationers; their outfits betray middle-class salaries and a complicated life. All you need to say is “hello” in order to make the local heads turn the other way, and then one is free to cross the narrow alleys without being observed anymore. This word seems more than enough to eradicate the label of Stranger, in the exact same way the smoke of the slow boat that carried the same Stranger to Anafi is vanishing: like a doctrine that dies. It doesn’t take that much time to get used to that settlement on the top of the rock and the initial indulgence soon transforms to insouciance. It is liberating to climb the stairs between walls that do not oppress you and at the same time act like a shelter from the howling wind. Up here, the trade is still in its archaic version and the feeling of being broke or petty is not a misfortune but a chance to gain access to whatever remains from life if you subtract all the norms: the sea, the soil and the bushes, with their peppery scent, stand there like an unripened summer. At Klisidi, a broad beach full of tamarisk trees, an occasional crowd takes a breather next to the stormy sea. The bodies that got shaped through gyms and weight control prefer to lay down complacently ashore, their feet digging holes in the sand. All this life of maintenance and preservation has dried the sense of danger within them and the only ones swimming are the middle-aged, faces that have no illusions of perfection to lose. The desire to exist prevails against the desire to lessen the risk. By contrast to the pretentious Santorini, the tacky trend of the sun-bed is non-existent here. One brings tomatoes, cheese and a bottle of water and tries to settle in beneath the tamarisk trees. You then have all the time in the world to see the sun following its orbit, to imagine the waves crashing at the Monolith, to observe the ants running in the hot sand, and to feel grateful for the breeze that visits the beach every now and then and cools down the salted skin. The rough sea bursts on the peaceful landscape, exactly as a man bursts when smothering from injustice. But, alas, you must know how to endure this prehuman rage: you don’t need berms against the sea. The curves of the white houses imitate the curves of the landscape. Those suspicious roofs have seen people migrating to distant cities and never return. The roofs know that a hundred and fifty heads will sleep there during the winter, people who won’t have the courage to leave the house when the wind will howl without mercy. They will expect a last dosage of hope from the boat that appears only twice a week, like a lost frame from a Visconti movie. It is the resurgence of the moral that keeps them alive though, not the supplies that the boat unloads. 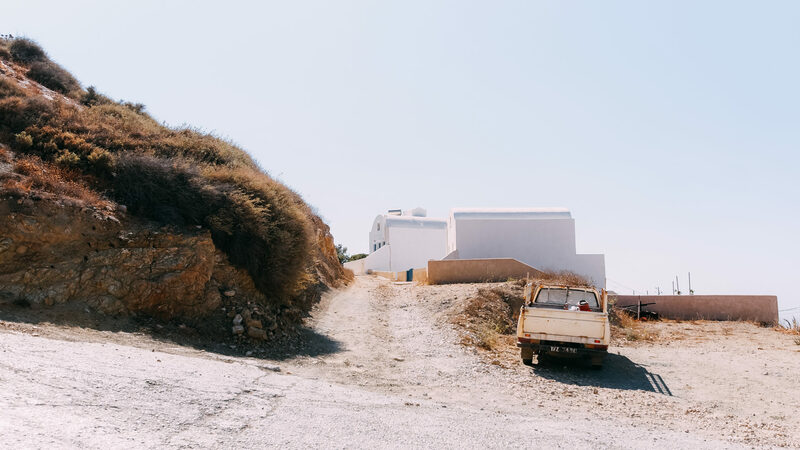 All those hills that the old bus is daily traversing on a slow speed isolate Chora from the rest of the island. The rattlesnake roads seem to push away the Monolith, which stands all alone on the edge, with a monastery on top. One can gaze from the butte two islands with vivid names, Pachia and Makra, both of them always being the first to taste the weather’s mood. The hikers on the way to the Monolith look at each other with some sort of complicity. None is revealing his secret, none succumbs to the temptation of sharing his life with a stranger he met on the way to endlessness. Like dots on an arid landscape, people hike towards the white rock as if they are sailing on a sea of traumas. Later in the evening, the lanky girls sit on the pavement of the little square and the locals stare at their wet hair. 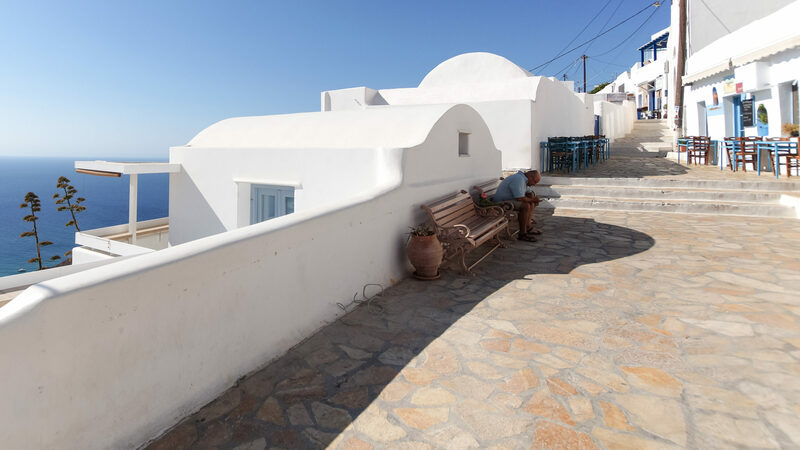 It is a spot that the alley broadens and seems to be demarcated by the two mini-markets of the island. The men sit on the chairs of the coffeehouse and listen to the girls’ laughter for a while, before they once again sink into their talk about daily life. They talk about hunting, share thoughts about council tax, as well as ideas on how the water will reach the fields. They contemplate the future of the island’s accommodation facilities. They light cigarettes, they blow their smoke and, when the only thing left from them is the filter, they stub them out on the ashtray with fingers made of steel. 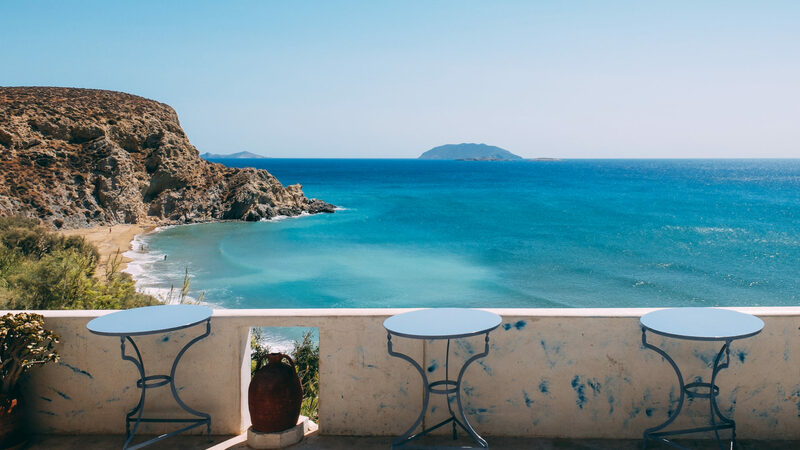 They have already forgotten the girls in their summer clothes, and they are so engaged in their talk that they fail to remember a basic rule: in the ashtrays of Anafi there always rests a wet napkin, so that the ashes won’t disperse. It’s not the people that let the night fall, but the square itself. The nights in Anafi have been identical for centuries: a luminous piping on the top of a rock and beneath it an unfathomable darkness. The talks seem to be recorded by a stenographer who’s using his last chalk. But humidity erases the words, and when the sun rises, no one remembers last night’s promises. This ritual is repeated continuously, without interruption, every night. 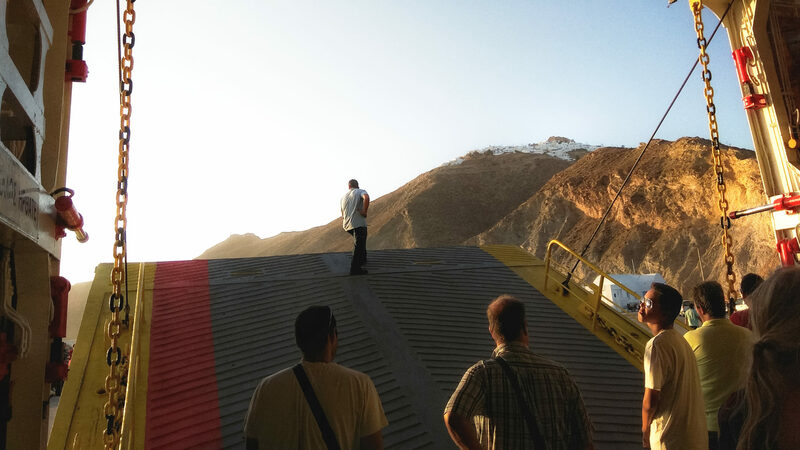 Yet, the day that one embarks on the morning boat, he will see Anafi for one last time. Up there, on the top of the rock, Chora appears like a white, shaky line. It is, of course, drawn by chalk. George Pavlopoulos was born in Athens, Greece in 1980. 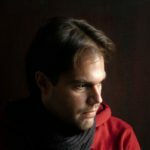 He is the author of three novels: 300 Kelvin in the Afternoon, (Alexandria Publications, 2007), Steam, (Kedros, 2011) and The Limit and the Wave (Potamos, 2014). Extended excerpts from his first two novels were featured in New York based online translation venue, InTranslation. His second novel Steam is in the permanent collection of Yale, Harvard, Princeton and Columbia libraries. He was a guest of the Hellenic Foundation for Culture at the 2015 Frankfurt Book Fair. In 2017, he participated in the International Short Story Festival of Istanbul. He has also written several travelogues and short stories. He currently lives in Berlin.